This was the next best thing to our wedding on the trip. We had to rebook due to bad weather, but soooo worth it. We went doors off, totally recommend it if your adventurous. A bit tense at beginning but a great experience. To me,,, the best way to se the island fore sure.. The staff, Jesi and John were all great to work with and helped us coordinate the trip. The view was amazing! Wonderful experience! First class all the way. This tour was so nice! Our tour guide was very knowledgable and nice. This was the highlight of our whole 10 days in Hawaii. Unbelievable!! I opted for doors off and definitely the right decision from a photography point of view. The Company were professional from start to finish and as there were seats for only 3 people plus the pilot of course!, so everyone has an unobstructed view. I highly recommend this tour. An absolutely wonderful experience! Our pilot, Raph, was great and offered insight to what we were looking at but not too much information that wouldn't have been necessary. We flew doors off and is really the only way to go... we've already referred others to the tour! A very interesting flight. As good as any other flights I have been on in the past. Enjoyed the hidden valley with the waterfall in the background. Well worth the trip. Great way to see the island and get a perspective for land based trips you may want to do later. Would recommend doors off as it adds to the experience - only takes 5 minutes or so to get over the terror! Maybe the hour tour could be improved by going further around the north side and over Ko Olina. Our pilot was great and provided good insight into various parts of the island. 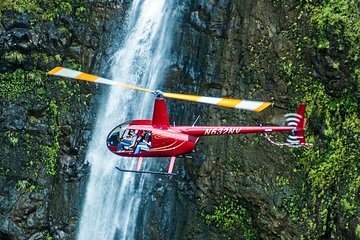 The hour long tour was worth every penny: we tour around the island, over Pearl Harbor and through mountain peaks to hidden water falls. Our pilot narrated our flight with interesting facts about the island and also gave us time to just look outside while Hawaiian music played through our headsets. I would definitely recommend this tour!